One of the many disappointing portions of linux. Thats what I always do with a new live usb trial. how do you restart networking? maybe i did that wrong? Topic: 17.2 Alert sounds HDMI; other sounds from laptop speakers?! 17.2 Alert sounds HDMI; other sounds from laptop speakers?! Topic: Bigfoot Networks Killer Wireless-N 1103 or 1202 Support? Re: Bigfoot Networks Killer Wireless-N 1103 or 1202 Support? I have the 1202 and trying to determine if 17.1 will support it or if there is a driver manager non-free version. Topic: How do I switch my desktop environment to XFCE or another? Have you guys gone back to LM or using something else? 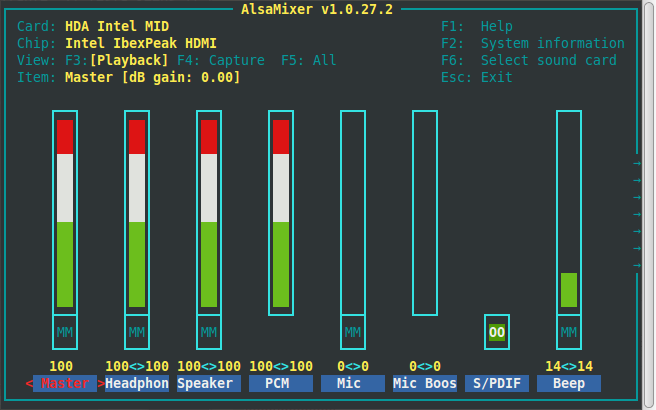 Using LM 17.1 64bit and alsamixer does not show me any unbalanced channels.